(Travel + Leisure) -- British naturalist Charles Darwin shocked Victorian society when he suggested that humans evolved from animals over millions of years, and his theories still spark controversy. Darwin enthusiasts can retrace the scientist's steps in the Galapagos Islands. 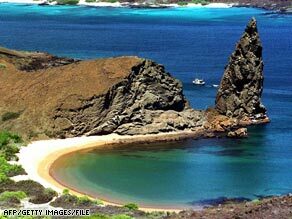 The Galapagos, of course, was where Darwin conducted key biological studies during his pivotal voyage on the HMS Beagle. Today, Darwin enthusiasts can retrace the scientist's steps, seeing the islands' black-sand beaches and blue-footed boobies on a cruise organized by the Charles Darwin Foundation in connection with Luxury Adventures (May 14-24). Randal Keynes, Darwin's great-great-grandson, will be a part of that trip; he'll also be on an Abercrombie & Kent excursion to Ecuador and the Galapagos (call for dates). Or go for a 10-day Galapagos cruise with International Expeditions (departures through December 28), which steers clear of large birthday events to create an immersive, intimate expedition. With stops at the Charles Darwin Research Station and a chance to see the famed finches on Fernandina Island, the 32 guests aboard the aptly named Evolution can snorkel with sea lions and sea turtles, explore lava tubes, or just enjoy the ride. Museums are jumping on the birthday bandwagon, too. The Yale Center for British Art in New Haven, Connecticut offers its "Endless Forms" exhibit (February 12-May 3) that explores the impact of Darwin's work on the visual arts. The Carnegie Museum of Natural History in Pittsburgh hosts a lecture series through April 18 on everything from cosmic time to everyday medical applications of Darwin's theory. On the West coast, the celebration continues at the Renzo Piano-designed California Academy of Sciences in San Francisco. As part of a citywide festival, Evolve 2009, the LEED-certified science museum will host a kickoff party on February 12 to start a season full of lectures and events through March. Where better to learn about a brilliant thinker than at a university? Harvard's Museum of Natural History, in Cambridge, Massachusetts is hosting both lectures and family-friendly events (February 12-March 5), where kids can meet a Darwin re-enactor. Every year, Michael Zimmerman heads up February's Evolution Weekend (this year, February 13-15), which celebrates Darwin's birthday at nearly 1,000 religious institutions across the U.S. People gather to discuss and reconcile Darwin's theory with personal faith. Sound a little esoteric? Zimmerman, a professor at Butler University in Indianapolis, believes that even the youngest children should learn about Darwin and evolution. "All young children are scientists by nature," he says. "They all regularly conduct experiments about the world." So bring the family on a trip, to a museum, or to a lecture to ensure you pass on more than just good genes. Planning a beach getaway? Don't miss Travel + Leisure's guide to Affordable Beach Resorts. Copyright 2009 American Express Publishing Corporation. All rights reserved.